This article is about the basketball player. For other people with the same name, see Stephen Curry (disambiguation). Despite Curry's 27 points in his return to the line-up on December 1, the Warriors were defeated 111–102 by the Detroit Pistons. On December 17, he scored 20 points in a 110–93 win over the Memphis Grizzlies, becoming just the fifth player in Warriors history to score 15,000 points during the regular season, joining Wilt Chamberlain (17,783), Rick Barry (16,447), Paul Arizin (16,266) and Chris Mullin (16,235). On December 23, he scored 42 points and made a layup with 0.5 seconds left to lift the Warriors to a 129–127 win over the Los Angeles Clippers. On January 5, he had 10 3-pointers and scored 20 of his 42 points in the fourth quarter of the Warriors' 127–123 win over the Sacramento Kings. 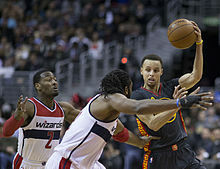 On January 11, in a 146–109 win over the Chicago Bulls, Curry made five 3-pointers to surpass Jason Terry (2,282) and move into third place all-time in NBA history behind Ray Allen (2,973) and Reggie Miller (2,560). Two days later, he scored 48 points and hit a season high-tying 11 3-pointers in a 119–114 win over the Dallas Mavericks. On January 16, he scored 41 points with nine 3-pointers to become the first player in NBA history to make eight or more 3s in three straight games, as the Warriors defeated the New Orleans Pelicans 147–140. On January 31, he scored 41 points with 10 3-pointers in a 113–104 loss to the Philadelphia 76ers. On February 21, he scored 36 points with 10 3-pointers in a 125–123 win over the Kings. On March 16 against the Oklahoma City Thunder, Curry reached 16,000 career points. On March 29, he made 11 3-pointers and scored 37 points in a 131–130 overtime loss to the Minnesota Timberwolves. 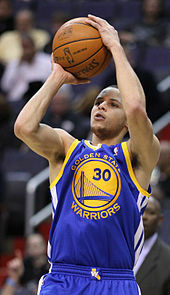 On April 2, in a 116–102 win over the Nuggets, Curry made five or more 3-pointers in a career-best nine straight games and moved past Mullin for fourth place on the Warriors all-time points list. On April 5, he scored 40 points in a 120–114 win over the Cleveland Cavaliers, thus moving past Arizin for third place on the Warriors all-time points list. The Warriors entered the playoffs as the first seed in the Western Conference with a 57–25 record. In Game 1 of the Warriors' first-round playoff series against the Clippers, Curry scored 38 points and made eight 3-pointers to give him the most in postseason history, passing Ray Allen (385). He also had a postseason career-high 15 rebounds and seven assists in a 121–104 win. Standing at 6 feet 3 inches tall (1.91 m) and weighing 190 pounds (86 kg), Curry plays almost exclusively at the point guard position and has career averages of 23.5 points, 6.6 assists, 4.5 rebounds, and 1.7 steals per game. He is a high-percentage free throw shooter, with a career free throw percentage of 90.5% through the end of the 2018–19 season, the highest in NBA history. Curry is the Warriors' all-time free-throw leader, and has led the NBA in free throw percentage four times. Although capable of stealing the ball, having led the league in steals for the 2015–16 season, he is not considered to be an elite defender, and his teammates frequently take the more difficult defensive assignments. He has been selected to five All-NBA Teams and voted league MVP twice. As a leader within the Warriors organization, he played a significant role in the recruitment of former MVP Kevin Durant to the Warriors. Curry's shooting ability ranges from scoring in great volume from underneath the rim all the way to near half-court. Using an unorthodox jump shot, he is able to get the ball out of his hands in under half a second by releasing it on the way up, adding extra arc to his shot and making it difficult to block. The shooting proficiency earned him the nickname "Baby-Faced Assassin" during his pre-NBA years and "Chef Curry" while in the NBA. He is additionally known for his ball handling and playmaking abilities, and for puttting extra pressure on defenses with his long range, leading the NBA in field goals made from beyond 28 feet in 2016. As of January 2019, Curry ranks third in NBA history in career three-point field goal percentage and holds four of the top five seasons in terms of total three-pointers made. He is also the fastest player in league history to make 2,000 career three-pointers, doing so in 227 fewer games than the previous record-holder, Ray Allen. A clutch scorer, he often shoots at his best in high-pressure moments, and takes game-winning shots. "No NBA athlete has a larger contingent of fans at every arena, lining up 20- and 30-deep hoping for a glimpse, if not an autograph. This crazy popularity is why his jersey sales consistently rank No. 1, why he was voted to be the captain of the  Western Conference All-Star team and why 9-year-old girls feel comfortable enough to write letters asking for his help -- and actually get it." 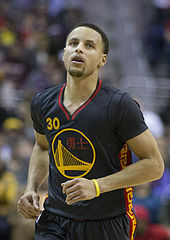 Curry is one of the most successful players in the NBA, and he has also become an international celebrity, on par with four-time MVP LeBron James. Like James, he has been considered the face of the NBA. His flashy play and penchant for coming up big in the clutch have made him a fan favorite, and his smaller physique is said to have made his success seem more attainable for younger fans of the NBA. Curry's jersey was the top seller in the NBA for the 2015–16 and 2016–17 NBA seasons. While discussion has concerned his image as representative of the NBA today, Curry has said that he is not playing to be the face of the NBA "or to take LeBron's throne or whatever. You know, I'm trying to chase rings, and that's all I'm about. So that's where the conversation stops for me." In April 2018, Sony Pictures Entertainment announced a wide-ranging, multiyear multimedia deal with Curry's newly-formed production company Unanimous Media (named for Curry becoming the first NBA player in history to be elected Most Valuable Player by a unanimous vote), located on the Sony Pictures studio lot in Culver City. The film and TV deal included electronics, gaming and virtual reality and will focus on faith and family-friendly content. In October 2018, Curry signed on as executive producer of the film Breakthrough, scheduled for release in April 2019. ^ In 2015–16, James Harden had the highest point total (2,376) but was second in scoring average (29.0). ^ a b "Is Steph Curry The Best Shooter Ever? Yes, Say Many of NBA's All-Time Marksmen". Bleacherreport.com. June 1, 2015. Retrieved June 1, 2015. ^ a b Abbott, Henry (March 18, 2016). "Stephen Curry isn't just the MVP -- he is revolutionizing the game". ESPN. Retrieved December 11, 2018. ^ a b Nadkarni, Rohan (May 31, 2018). "The NBA Has Never Seen a Shooter Like Stephen Curry". Sports Illustrated. Retrieved December 11, 2018. ^ a b c d e f g Dougherty, Jesse (March 5, 2018). "The Steph Effect: How NBA star is inspiring — and complicating — high school basketball". The Washington Post. Retrieved December 11, 2018. ^ Foltin, Lindsey (June 2, 2016). "LeBron-Curry Finals inspires unique 'Akron Born' promotion for local business". FoxSports.com. Fox Sports Interactive Media, LLC. Archived from the original on June 9, 2016. Retrieved June 8, 2016. But not many realize that it's also the birthplace of two-time NBA MVP Stephen Curry, who was born at Akron City Hospital in 1988 when his father, Dell Curry, was a member of the Cleveland Cavaliers. ^ Williams, Travis (June 14, 2015). "Curry rooted in storied New River Valley family tree". SportingNews.com. Retrieved April 30, 2016. ^ a b "Dell Curry NBA Stats". Basketball Reference. Retrieved February 28, 2016. ^ "Stephan Curry, Golden State Warriors". Fellowship of Christian Athletes. Archived from the original on January 24, 2014. Retrieved August 20, 2014. ^ "Stephen Curry's Grade 8 season at tiny Toronto school remembered". Toronto Star. Retrieved February 27, 2015. ^ a b "Northern Touch: Steph Curry's Toronto connection". Sportsnet.ca. Retrieved February 27, 2015. ^ a b "Curry's path to NBA stardom forged in Toronto". Sportsnet.ca. Retrieved January 25, 2016. ^ a b "Canada's quest for elite basketball status begins in Toronto". The Globe and Mail. Retrieved January 25, 2016. ^ Wong, Alex (February 11, 2016). "When Stephen Curry was Canadian: Warriors' MVP dominated Toronto's 8th-grade scene". SportingNews.com. Retrieved February 12, 2016. ^ Posnanski, Joe (March 28, 2008). "Kansas will have to deal with Stephen Curry to get to Final Four". Kansas City Star. Archived from the original on December 15, 2008. ^ Forde, Pat. "How Stephen Curry went from ignored college recruit to possible NBA MVP". Yahoo! Sports. Retrieved February 28, 2016. ^ Garcia, Marlen (March 21, 2008). "Davidson duo key to Wildcats' chances for rare tourney win". USA Today. Retrieved March 23, 2008. ^ "And Then There Were Two: Championship Set for Saturday – SoConSports.com—Official Web Site of The Southern Conference". Soconsports.com. Retrieved September 17, 2010. ^ "Davidson College Basketball: February 2007". Davidsonbasketball.blogspot.com. Retrieved September 17, 2010. 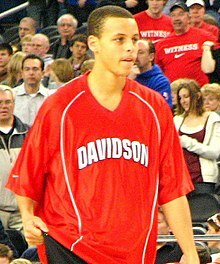 ^ a b "Sophomore sensation Curry returning to Davidson". Sports.espn.go.com. March 31, 2008. Retrieved September 17, 2010. ^ "Curry shrugs off the glory in Davidson's Elite run". Sports.espn.go.com. March 29, 2008. Retrieved September 17, 2010. ^ "ESPN – For first time in six decades, no seniors on AP All-America team – Men's College Basketball". Sports.espn.go.com. March 31, 2008. Retrieved September 17, 2010. ^ Hui, Ray. "Stephen Curry: First Most Outstanding Player From Losing Team Since Juwan Howard – FanHouse – AOL Sports Blog". Sports.aol.com. Retrieved September 17, 2010. ^ "Davidson College Athletics – Stephen Curry Named Top 30 Candidate for Naismith Trophy". Davidsonwildcats.com. Archived from the original on July 30, 2012. Retrieved September 17, 2010. ^ "Curry scores 44, Davidson beats NC State 72–67". WCNC-TV. Retrieved February 4, 2019. ^ "The Citadel beats Curry-less Davidson 64–46". sandiegouniontribune.com. February 18, 2009. Retrieved January 3, 2009. ^ "Curry sets mark, Davidson routs Ga Southern 99–56". Associated Press. Retrieved September 17, 2010. ^ "2008–09 Davidson Wildcats Schedule and Results | College Basketball at". Sports-reference.com. Retrieved April 9, 2013. ^ "Southern Conference Standings – College Basketball – ESPN". Espn.go.com. Retrieved April 9, 2013. ^ CBSSports.com wire reports. "Southern: Davidson's Curry drops 43 on Appalachian State – NCAA Division I Mens Basketball – CBSSports.com News, Scores, Stats, Schedule and RPI Rankings". Cbssports.com. Retrieved April 9, 2013. ^ "Davidson sent packing by College of Charleston in Southern semis – USATODAY.com". Usatoday30.usatoday.com. March 9, 2009. Retrieved April 9, 2013. ^ "Davidson Wildcats – South Carolina Gamecocks Box Scores, Game Results & Summary – USATODAY.com". Content.usatoday.com. March 18, 2009. Retrieved April 9, 2013. ^ Will Bryan (Correspondent) (March 18, 2009). "Davidson: An NIT Miracle". Bleacher Report. Retrieved April 9, 2013. ^ "Stephen Curry Stats | College Basketball at". Sports-reference.com. Retrieved April 9, 2013. ^ "Stephen Curry of Davidson entering NBA draft – ESPN". Sports.espn.go.com. April 23, 2009. Retrieved April 9, 2013. ^ Simmons, Rusty (July 9, 2009). "Curry signs deal". sfgate.com. Retrieved October 21, 2018. ^ a b c d e f g h i j k l m n "Stephen Curry stats, details, videos, and news". NBA.com. Retrieved October 21, 2018. ^ a b Dubow, Josh (April 29, 2010). "NBA: Sacramento guard Tyreke Evans wins NBA Rookie of the Year award". deseretnews.com. Retrieved October 21, 2018. ^ "Stephen Curry takes the 2011 Taco Bell Skills Challenge". NBA.com. February 20, 2011. Retrieved October 21, 2018. ^ "Warriors Guard Stephen Curry Undergoes Successful Surgery On Right Ankle". NBA.com. May 25, 2011. Retrieved October 21, 2018. ^ "Warriors Guard Stephen Curry Undergoes Successful Surgery On Right Ankle". NBA.com. April 25, 2012. Retrieved October 21, 2018. ^ Spears, Marc J. (October 31, 2012). "Stephen Curry lands $44M contract extension". Yahoo.com. Retrieved February 15, 2015. ^ "Warriors Sign Stephen Curry To Multi-Year Extension". NBA.com. October 31, 2012. Retrieved October 21, 2018. ^ McIntyre, Jason (December 3, 2015). "Three Years Ago, Here's What Basketball Writers Were Saying About Stephen Curry's Ankle and His Future with the Warriors". TheBigLead.com. Retrieved January 3, 2016. ^ Spears, Marc J. (February 13, 2015). "Origin of Stephen Curry's and Klay Thompson's 'Splash Brothers' nickname". Yahoo.com. Retrieved January 3, 2016. ^ "Curry sets franchise record for 3-pointers". CSN Bay Area. Archived from the original on December 11, 2013. Retrieved February 15, 2015. ^ "Curry starts in first All-Star Game; LeBron top vote-getter". NBA.com. January 23, 2014. Retrieved January 25, 2014. ^ "2014 NBA Playoffs Summary". Basketball-Reference.com. Retrieved January 3, 2016. ^ 2014–15 NBA Leaders. Retrieved May 27, 2015. ^ Lowe, Zach. "Simply Golden: How the Warriors Became the Total Package". Grantland. Retrieved January 3, 2016. ^ Devine, Dan. "Warriors' Steve Kerr caps remarkable rookie season with NBA championship". Yahoo! Sports. Retrieved January 10, 2016. ^ "Curry scores 51, Warriors rally from 22 down to stun Mavs". NBA.com. February 4, 2015. Retrieved February 15, 2015. ^ "Warriors' Curry leading vote-getter, surpassing LeBron, for 2015 All-Star Game". NBA.com. January 22, 2015. Retrieved February 16, 2015. ^ "Stephen Curry wins 3-point crown". ESPN. February 15, 2015. Retrieved February 15, 2015. ^ Gonzalez, Antonio (April 9, 2015). "Curry breaks 3-point record, Warriors beat Blazers 116–105". NBA.com. Turner Sports Interactive, Inc. Retrieved May 17, 2015. ^ a b c "Stephen Curry NBA Stats". Basketball Reference. Retrieved January 4, 2019. ^ Sam, Amick. "Why Stephen Curry is the NBA's MVP". USA Today. Retrieved January 10, 2016. ^ "Stephen Curry Lights Out in Game 5 Win vs Grizzlies (VIDEO)". SLAMonline. May 14, 2015. ^ Freeman, Eric (May 16, 2015). "Curry's 62-foot buzzer-beater propels Warriors over Grizzlies, into West finals". Yahoo! Sports. Yahoo Inc. Retrieved May 17, 2015. ^ "Curry, Golden State rout Houston 115–80 to take 3–0 lead". NBA.com. May 23, 2015. Retrieved January 11, 2016. ^ "Stephen Curry sets record for most threes in playoffs, passing Reggie Miller". nbcsports.com. May 23, 2015. Retrieved January 11, 2016. ^ "Stephen Curry's shot goes missing for Warriors in Game 2 loss". ESPN. Retrieved January 10, 2016. ^ a b "2015 NBA Finals". Basketball Reference. Retrieved January 10, 2016. ^ Hopkins, Christopher Dean. "Golden State Warriors Bring Home Their First NBA Title In 40 Years". NPR. Retrieved January 10, 2016. ^ "Curry's big 3rd quarter leads Warriors past Pelicans 134–120". NBA.com. October 31, 2015. Retrieved October 31, 2015. ^ "Warriors make NBA history as first team to start season 16–0". NBA.com. November 24, 2015. Retrieved November 24, 2015. ^ "Curry, Warriors beat Boston 124-119 in 2OT, improve to 24-0". NBA.com. December 11, 2015. Retrieved January 15, 2019. ^ "It's over: Bucks hand Warriors 1st loss, win 108–95". NBA.com. December 12, 2015. Retrieved December 12, 2015. ^ "Curry's triple-double leads Warriors past Kings 122–103". NBA.com. December 28, 2015. Retrieved December 29, 2015. ^ "Curry's triple-double leads Warriors to win in Kerr's return". NBA.com. January 22, 2016. Retrieved January 22, 2016. 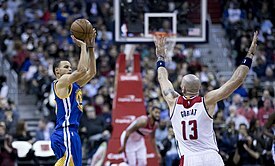 ^ "Curry lights up Wizards for Warriors' 8th straight win". NBA.com. February 3, 2016. Retrieved February 4, 2016. ^ "Curry flirts with triple-double, Warriors top Suns 112–104". NBA.com. February 10, 2016. Retrieved February 11, 2016. ^ "Curry has 51, hits 3-pointer in record 128th straight game". NBA.com. February 25, 2016. Retrieved February 26, 2016. ^ "Stephen Curry Ties Single-Game Record for Made 3-Pointers". YouTube.com. February 27, 2016. Retrieved February 27, 2016. ^ "Curry hits winning 3, sets record as Warriors beat Thunder". NBA.com. February 27, 2016. Retrieved February 27, 2016. ^ "Curry is first player to make 300 3s in a single season". NBA.com. March 7, 2016. Retrieved March 8, 2016. ^ "Warriors' home winning streak ends at 54 in loss to Celtics". NBA.com. April 1, 2016. Retrieved April 2, 2016. ^ "Warriors become 2nd NBA team to win 70, beat Spurs 112–101". NBA.com. April 7, 2016. Retrieved April 8, 2016. ^ "Curry shoots Warriors to 73rd win, breaking Bulls' mark". NBA.com. April 13, 2016. Retrieved April 13, 2016. ^ Kurtenbach, Dieter (April 13, 2016). "Stephen Curry just finished the greatest individual regular season in NBA history". FoxSports.com. Retrieved April 14, 2016. ^ "Stephen Curry Named Unanimous Winner of 2015–16 Kia NBA Most Valuable Player Award". NBA.com. May 10, 2016. Retrieved May 10, 2016. ^ "Stephen Curry leads Warriors past Rockets in playoff opener". NBA.com. April 16, 2016. Retrieved April 18, 2016. ^ "Harden's late shot lifts Rockets over Warriors 97–96". NBA.com. April 21, 2016. Retrieved April 21, 2016. ^ "Curry hurts knee but Warriors beat Rockets 121–94 in Game 4". NBA.com. April 24, 2016. Retrieved April 24, 2016. ^ "Warriors' Stephen Curry out at least 2 weeks with MCL sprain". ESPN.com. April 25, 2016. Archived from the original on April 25, 2016. ^ Richman, Mike (May 9, 2016). "Stephen Curry returns to MVP form as Golden State Warriors beat Trail Blazers in Game 4". OregonLive.com. Retrieved May 9, 2016. ^ "Curry returns with 40 points in 132–125 OT win over Blazers". NBA.com. May 9, 2016. Retrieved May 9, 2016. ^ "Curry and record-setting Warriors headed back to NBA Finals". NBA.com. May 30, 2016. Retrieved May 30, 2016. ^ Cacciola, Scott (June 16, 2016). "For Warriors' Stephen Curry, Staying Power Is Pushed to the Limits". The New York Times. Archived from the original on June 18, 2016. ^ Feldman, Dan (June 17, 2016). "Stephen Curry sets record for 3-pointers in a Finals". NBCSports.com. Archived from the original on June 18, 2016. ^ "James and Cavaliers win thrilling NBA Finals Game 7, 93–89". NBA.com. June 19, 2016. Retrieved June 19, 2016. ^ "Durant helps Warriors bounce back, beat Pelicans 122–114". ESPN.com. October 28, 2016. Retrieved October 29, 2016. ^ a b "Lakers stun Warriors 117–97, end Steph's 3-point streak". ESPN.com. November 4, 2016. Retrieved November 5, 2016. ^ "Sweet shot: Stephen Curry hits NBA-record 13 3-pointers". ESPN.com. November 7, 2016. Retrieved November 8, 2016. ^ "Klay Thompson sparks Warriors' rally in 4th against Wolves". ESPN.com. December 11, 2016. Retrieved December 11, 2016. ^ "Kevin Durant gets 1st triple-double with Warriors in win over Mavs". ESPN.com. December 30, 2016. Retrieved December 31, 2016. ^ "Stephen Curry Named Western Conference Player of the Week". NBA.com. January 9, 2017. Retrieved January 9, 2017. ^ "Curry, Durant and four first-time starters highlight starting lineups for NBA All-Star 2017". NBA.com. January 19, 2017. Retrieved January 19, 2017. ^ "Warriors beat Clippers 133-120 for 9th straight win over LA". ESPN.com. February 2, 2017. Retrieved February 3, 2017. ^ "Curry ends slump with 31, Warriors beat Knicks 112-105". ESPN.com. March 5, 2017. Retrieved March 6, 2017. ^ "Curry's 30 lead Warriors to sweep after 121-95 win over Jazz". ESPN.com. May 8, 2017. Retrieved May 9, 2017. ^ "Warriors rally for 113-111 win after Spurs lose Leonard". ESPN.com. May 14, 2017. Retrieved May 14, 2017. ^ "Kevin Durant powers Warriors to take 3-0 lead against Spurs". ESPN.com. May 20, 2017. Retrieved May 21, 2017. ^ "Curry, Durant lead Warriors to 2-0 lead with 132-113 rout". ESPN.com. June 4, 2017. Retrieved June 5, 2017. ^ "Kevin Durant, Stephen Curry lead Warriors to NBA title". ESPN.com. June 12, 2017. Retrieved June 13, 2017. ^ Wojnarowski, Adrian (July 1, 2017). "Stephen Curry's supermax deal becomes richest in NBA history". ESPN.com. Retrieved July 21, 2017. ^ "Thompson has 27 points, Warriors rout Magic 133-112". ESPN.com. December 1, 2017. Retrieved December 2, 2017. ^ a b "Stephen Curry becomes fastest to reach 2,000 3-pointers made". NBA.com. December 4, 2017. Retrieved December 6, 2017. ^ Medina, Mark (December 4, 2017). "Stephen Curry on ankle injury: "I'll be back"". MercuryNews.com. Retrieved December 6, 2017. ^ "Stephen Curry Injury Update". NBA.com. December 5, 2017. Retrieved December 6, 2017. ^ "Curry scores season-high 45 points, Warriors beat Clippers". ESPN.com. January 6, 2018. Retrieved January 6, 2018. ^ "Durant has triple-double, Warriors hit 21 3s to beat Wolves". ESPN.com. January 25, 2018. Retrieved January 26, 2018. ^ "Curry tweaks ankle, has 28 as Warriors top Hawks". ESPN.com. March 2, 2018. Retrieved March 2, 2018. ^ "Stephen Curry scores 34 points, leads Warriors past Nets". ESPN.com. March 6, 2018. Retrieved March 6, 2018. ^ "Stephen Curry Injury Update - 3/24/17". NBA.com. March 24, 2018. Retrieved March 24, 2018. ^ "Stephen Curry returns to score 28, Warriors beat Pelicans". ESPN.com. May 1, 2018. Retrieved May 1, 2018. ^ Ward-Henninger, Colin (June 9, 2018). "Warriors vs. Cavs: NBA Twitter irate over Stephen Curry losing 2018 Finals MVP to Kevin Durant". CBSSports.com. Retrieved June 9, 2018. ^ Charania, Shams (June 9, 2018). "There's still no Finals MVP trophy for Stephen Curry, only a growing legacy". Yahoo!. Retrieved June 9, 2018. ^ Nadkarni, Rohan (June 9, 2018). "For the Third Time in Three Titles, Stephen Curry's Greatness Goes Unrecognized". Sports Illustrated. Retrieved June 9, 2018. ^ "Hernangomez's late block helps Nuggets beat Warriors 100-98". ESPN.com. October 21, 2018. Retrieved October 21, 2018. ^ "Stephen Curry scores 51 points with 11 3s as Warriors win". ESPN.com. October 24, 2018. Retrieved October 24, 2018. ^ a b "Curry sets another record for 3s, Warriors hold off Nets". ESPN.com. October 28, 2018. Retrieved October 28, 2018. ^ "Westbrook stars, Diallo hurt in Thunder's win over Warriors". ESPN.com. November 21, 2018. Retrieved November 29, 2018. ^ "Leonard scores 37, Raptors beat Warriors 131-128 in OT". ESPN.com. November 29, 2018. Retrieved November 29, 2018. ^ "Griffin, Drummond lead Pistons over Curry, Warriors 111-102". ESPN.com. December 1, 2018. Retrieved December 2, 2018. ^ "Curry becomes 5th Warrior with 15,000 regular-season points". ESPN.com. December 17, 2018. Retrieved December 17, 2018. Chamberlain leads the way with 17,783, followed by Barry (16,447), Arizin (16,266) and Mullin (16,235). ^ "Curry makes last-second layup, Warriors beat Clippers". ESPN.com. December 23, 2018. Retrieved December 24, 2018. ^ "Curry scores 42 points, Warriors hold off Kings 127-123". ESPN.com. January 5, 2019. Retrieved January 6, 2019. ^ "Klay Thompson torches Bulls again in Warriors 146-109 win". ESPN.com. January 11, 2019. Retrieved January 12, 2019. ^ "Curry scores 48, hits 11 3s as Warriors beat Mavs 119-114". ESPN.com. January 13, 2019. Retrieved January 13, 2019. ^ "Stephen Curry scores 41 points as Warrior hold off Pelicans". ESPN.com. January 16, 2019. Retrieved January 17, 2019. ^ "Embiid, 76ers spoil DeMarcus Cousins' home Warriors debut". ESPN.com. January 31, 2019. Retrieved February 1, 2019. ^ "Curry scores 36 as Warriors hold off Kings 125-123". ESPN.com. February 21, 2019. Retrieved February 22, 2019. ^ Thanawalla, Ali (March 16, 2019). "Steph Curry goes over 16,000 NBA career points with layup vs. Thunder". nbcsports.com. Retrieved March 18, 2019. ^ "Towns' free throw lifts Timberwolves over Warriors in OT". ESPN.com. March 29, 2019. Retrieved March 30, 2019. ^ "Warriors beat Nuggets, increase lead for top seed in West". ESPN.com. April 2, 2019. Retrieved April 3, 2019. ^ "Curry moves up Warriors' scoring charts in win over Cavs". ESPN.com. April 5, 2019. Retrieved April 6, 2019. ^ "Curry's 38 points lead Warriors to Game 1 win over Clippers". ESPN.com. April 13, 2019. Retrieved April 13, 2019. ^ "USA Basketball: Stephen Curry". USA Basketball Official Website. Retrieved January 10, 2016. ^ "Team USA Profile – 2010 FIBA World Championship". 2010 Turkey FIBA Official Website. Archived from the original on January 16, 2016. Retrieved January 10, 2016. ^ "USA Fires Its Way To FIBA World Cup Gold Medal, 129–92 Win Over Serbia". USA Basketball Official Website. Retrieved January 10, 2016. ^ Neuharth-Keusch, AJ (June 6, 2016). "Stephen Curry withdraws from consideration for Team USA at 2016 Olympics". USAToday.com. Retrieved June 6, 2016. ^ a b "Golden State Warriors Career Leaders - Basketball-Reference.com". Basketball-Reference.com. ^ "NBA & ABA Career Leaders and Records for Free Throw Pct | Basketball-Reference.com". Basketball-Reference.com. Retrieved December 6, 2017. ^ "NBA & ABA Year-by-Year Leaders and Records for Free Throw Pct - Basketball-Reference.com". Basketball-Reference.com. ^ a b "Strauss: How Stephen Curry wrecks defenses without the ball". ESPN.com. Retrieved August 6, 2017. ^ "Stephen Curry embraces leadership role with Warriors". The Mercury News. September 5, 2013. Retrieved August 6, 2017. ^ a b Thompson II, Marcus (May 30, 2017). "Thompson: How Stephen Curry got his groove back after NBA Finals devastation". The Mercury News. Retrieved August 6, 2017. ^ Wire, SI. "Report: Curry fine with not being face of Warriors". SI.com. Retrieved August 6, 2017. ^ "Stephen Curry is extending his range to 10 feet behind the 3-point line". For The Win. November 10, 2015. Retrieved August 6, 2017. ^ Fleming, David. "Sports' perfect 0.4 seconds". ESPN. Retrieved January 10, 2016. ^ Thompson II, Marcus (April 6, 2017). "Stephen Curry in Middle School: The Origin of the Baby Faced Assassin". Bleacher Report. Retrieved January 18, 2019. ^ Rohrbach, Ben (May 7, 2018). "Chinese internet users have the most incredible nicknames for NBA players". Yahoo!. Retrieved January 18, 2019. ^ a b c d Jenkins, Sally (April 8, 2016). "The hidden price Steph Curry pays for making the impossible seem effortless". The Washington Post. Retrieved January 16, 2019. ^ "In 2015–16, in the regular season, shot distance between 28 and 43 feet, sorted by descending Field Goals". Basketball-Reference.com. Retrieved March 6, 2016. ^ Friedell, Nick (January 12, 2019). "Stephen Curry now stands behind only Ray Allen, Reggie Miller for career 3s". ESPN. Retrieved January 15, 2019. ^ "NBA & ABA Single Season Leaders and Records for 3-Pt Field Goals". Basketball Reference. Retrieved January 10, 2016. ^ "Stephen Curry has become lethal in the biggest moments, and it has taken his game to another level". Business Insider. Retrieved August 6, 2017. ^ Fromal, Adam. "Stephen Curry Is NBA Clutch King and These Are His Imitators at Every Position". Bleacher Report. Retrieved August 6, 2017. ^ "NBA Finals 2017: How Stephen Curry's gravity puts Cavs in impossible positions". Retrieved August 6, 2017. ^ Haberstroh, Tom (November 21, 2018). "Steph Curry is Warriors' breaking point". NBC Sports. Retrieved December 11, 2018. ^ Davis, Scott (June 9, 2018). "How Stephen Curry became the best shooter the NBA has ever seen". Business Insider. Retrieved January 16, 2019. ^ a b c d e f g Goldsberry, Kirk (January 16, 2019). "Steph Curry is still completely unfair". ESPN. Retrieved January 16, 2019. ^ Haberstroh, Tom (November 8, 2018). "Stephen Curry is the new Michael Jordan". NBC Sports. Retrieved December 11, 2018. ^ Poole, Monte (November 7, 2016). "Steph Curry is the Michael Jordan of the 3-point revolution". NBC Sports. Retrieved December 11, 2018. ^ Bort, Ryan (March 9, 2016). "Steph Curry May Be the Best Shooter to Ever Play in the NBA". Newsweek. Retrieved December 11, 2018. ^ a b O'Connell, Robert (November 8, 2018). "Five years ago Stephen Curry's 54-point game helped redefine the NBA". The Guardian. Retrieved December 11, 2018. ^ Morris, Benjamin (December 3, 2015). "Stephen Curry Is The Revolution". fivethirtyeight.com. Retrieved January 10, 2016. ^ a b c d e Davis, Owen (December 20, 2018). "Stephen Curry in profile: Two-time MVP who changed the face of the NBA". Sky Sports. Retrieved January 17, 2019. ^ a b c Windhorst, Brian (October 31, 2018). "Steph Curry is the ultimate one-off". ESPN. Retrieved January 17, 2019. ^ "Golden State Warriors Guard Stephen Curry Married His College Sweetheart Ayesha Alexander". jocksandstilettojill.com. August 3, 2011. Retrieved September 16, 2011. ^ Dorsey, Patrick (August 1, 2012). "Fans draw for Stephen Curry's daughter". ESPN. Retrieved August 3, 2012. ^ "Golden State Warriors' Steph Curry's wife announces birth of baby girl". Retrieved July 12, 2015. ^ Vulpo, Mike (July 4, 2018). "Ayesha and Stephen Curry Welcome Baby No. 3—Find Out the Name Of Their Son". E! Online. Retrieved July 5, 2018. ^ Touring the many homes of Stephen Curry – Curbed SF Retrieved November 21, 2016. ^ "Sydel Alicia Curry". Elon University. 2015. Retrieved June 12, 2015. ^ "Curry: In His Own Words". fca.org. Retrieved June 16, 2015. ^ "Stephen Curry Interview | Prodigal Magazine". Prodigalmagazine.com. February 16, 2009. Archived from the original on April 4, 2016. Retrieved September 16, 2011. ^ Borkett-Jones, Lucinda. "NBA MVP Stephen Curry's acceptance speech: 'I'm God's humble servant'". Christianitytoday.com. Retrieved June 16, 2015. ^ Thomasos, Christine. "Stephen Curry's New Basketball Sneaker Features Bible Verse". The Christian Post. Retrieved June 16, 2015. ^ Schultz, E.J. "Under Armour Has High Hopes for Stephen Curry Shoe Launch in Battle Against Nike". Advertising Age. Retrieved June 16, 2015. ^ "Stephen Curry's mother: Trip to Israel 'transformed' my life". The Jerusalem Post | JPost.com. Retrieved November 5, 2015. ^ "Athletes Wearing Active Faith". ^ Freeman, Eric (June 24, 2015). "Stephen Curry sent Dražen Petrović's mother one of his NBA Finals jerseys". Ball Don't Lie. Yahoo! Sports. Retrieved June 25, 2015. ^ "Kawakami: Round of golf therapeutic for Curry, Iguodala". The Mercury News. May 17, 2015. Retrieved August 6, 2017. ^ "Stephen Curry — the NBA's best golfer — reveals his favorite golf holes". Business Insider. Retrieved August 6, 2017. ^ "Stephen Curry's Family Thinks He Has Potential To Be A Professional Golfer". ThePostGame. February 25, 2015. Retrieved August 6, 2017. ^ Staff, NBA.com. "Stephen Curry finishes fourth at celebrity golf tournament, wins lake-jump bet with dad". NBA.com. Retrieved August 6, 2017. ^ Pandian, Ananth (August 8, 2016). "LOOK: Steph Curry spotted golfing with President Obama in Martha's Vineyard". CBSSports.com. Retrieved August 6, 2017. ^ "Stephen Curry to compete in Web.com Tour golf event". NBA.com. Retrieved August 6, 2017. ^ "Curry shoots 74 again at Web.com, misses cut". ESPN.com. Retrieved August 6, 2017. ^ a b Poole, Monte (December 1, 2018). "Why Steph Curry's return means just as much to NBA as it does Warriors". NBC Sports. Retrieved December 11, 2018. ^ Wire, SI. "One tweet that shows how quickly Steph Curry became a star". SI.com. Retrieved August 6, 2017. ^ "As Warriors rise, so does Stephen Curry's stardom". USA TODAY. Retrieved August 6, 2017. ^ Kruse, Michael. "Meet Steph Curry, the NBA's Most Beloved Megastar". Bleacher Report. Retrieved August 6, 2017. ^ Phillips, Brian (April 24, 2015). "The Rise and Rise (and Rise) of Stephen Curry: The Wildly Miraculous and Quietly Inevitable Success of Golden State's Point Guard". Grantland. Retrieved August 6, 2017. ^ release, Official. "Stephen Curry leads NBA's most popular jersey list for second consecutive season". NBA.com. Retrieved August 6, 2017. ^ Greenburg, Zack O'Malley. "Full List: The World's Highest-Paid Celebrities 2017". Forbes. Retrieved August 6, 2017. ^ "How do Warriors stars rank in ESPN's 100 most famous athletes?". The Mercury News. May 31, 2017. Retrieved August 6, 2017. ^ Wattles, Jackie (September 16, 2015). "Under Armour is upping its game with Steph Curry". CNNMoney. Retrieved August 6, 2017. ^ "TrueHoop Presents: You won't believe how Nike lost Steph". ESPN.com. Retrieved August 6, 2017. ^ Gensler, Lauren. "Under Armour Sales Jump 30% As Stephen Curry Shoes Prove A Slam Dunk". Forbes. Retrieved August 6, 2017. ^ "Waning interest in Steph Curry shoes? Under Armour stock slumps". USA TODAY. Retrieved August 6, 2017. ^ "Stephen Curry Signs Exclusive Collectibles Deal With Steiner Sports Memorabilia". steinersports.com. Retrieved September 20, 2017. ^ "Bloomberg - Are you a robot?". www.bloomberg.com. Retrieved October 19, 2018. ^ "Steph Curry and the new Palm want you to forget your phone". Fast Company. October 15, 2018. Retrieved October 19, 2018. ^ Leung, Diamond (February 25, 2015). 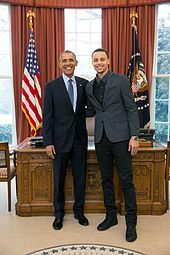 "Warriors' Stephen Curry meets President Obama". San Jose Mercury News. Archived from the original on February 10, 2016. ^ Smith, Gayle (February 26, 2015). "Putting an End to a Preventable Scourge". WhiteHouse.gov. Archived from the original on February 10, 2016. ^ a b Leung, Diamond (February 14, 2015). "Stephen Curry to honor North Carolina shooting victim". San Jose Mercury. Retrieved February 16, 2015. ^ Jhaveri, Hemal (February 16, 2015). "Steph Curry plans to give special sneakers to family of Chapel Hill victim". USA Today. Retrieved February 16, 2015. ^ Simmons, Rusty (February 14, 2015). "Steph Curry Talks About Honoring A North Carolina Shooting Victim". The Post Game Network. Retrieved February 16, 2015. ^ Simmons, Rusty (February 16, 2015). "Curry is All-Star everyman, and everyone wants a piece of him". USA Today. Retrieved February 16, 2015. ^ Wang, Alan (May 5, 2015). "Steph Curry donates MVP prize to East Oakland children's charity". Retrieved August 12, 2016. ^ Reed, Jesse (January 14, 2019). "Curry's 'Moon Landing' shoes sell for $58K at charity auction". MSN. Retrieved January 16, 2019. ^ Kleinschmidt, Jessica (January 14, 2019). "Warriors' Stephen Curry 'Moon Landing' shoes auctioned off for $58,000". NBC Sports. Retrieved January 16, 2019. ^ a b "NBA Star Stephen Curry Scores Film and TV Pact With Sony (Exclusive)". The Hollywood Reporter. Retrieved April 24, 2018. ^ "2015–16 NBA Season Summary". Basketball-Reference.com. Retrieved April 14, 2016. ^ "NBA & ABA Single Season Leaders and Records for 3-Pt Field Goals". Basketball-Reference.com. Sports-Reference. Retrieved June 17, 2016. ^ "NBA & ABA Single Season Playoff Leaders and Records for 3-Pt Field Goals". Basketball-Reference.com. Sports-Reference. Retrieved June 20, 2016. ^ "Stephen Curry Named To Dream Team of Public Service | THE OFFICIAL SITE OF THE GOLDEN STATE WARRIORS". www.nba.com. Retrieved September 25, 2017. ^ "ESPYs 2015: Full Winners List". Variety.com. July 15, 2015. Retrieved July 15, 2015. ^ "BET Award for Sportsman of the Year". BET.com. Retrieved July 15, 2015. ^ "Warriors' Stephen Curry named AP male athlete of the year". theglobeandmail.com. December 27, 2015. Retrieved December 27, 2015. ^ "List of 2016 ESPYS Nominees". ESPN MediaZone. Retrieved July 18, 2016.